Kaori Fujimiya is always seen alone, without friends, and distant. Her classmate, Yūki Hase, however doesn't believe her to be cold and distant as other people believe, so he makes an honest effort to become her friend. He later learns the truth Kaori's memory of her friends reset every Monday. Despite learning this fact, he is determine to be her friend, even if he has to do it over again every Monday. Story - It's undeniable that One Week Friends is meant to be heartwarming, and does a really good job at it. 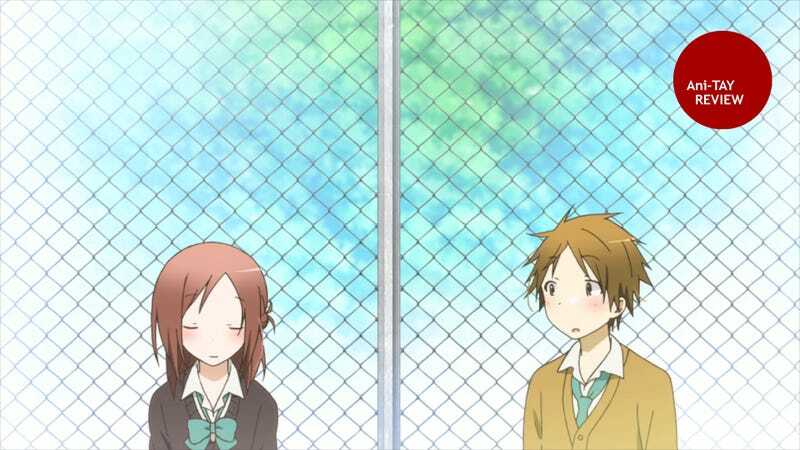 Even with an unlikely plot device of memory lost, the show still manage to do an excellent job staying true to being a slice of life story about innocent high school friendship. Even the beach episode was sweet, and I normally dislike beach episode because it tends to be overwhelmed with fanservice, but not here. It's as pure and innocent as the other episodes. Characters - They're wonderful, likeable and most importantly believable. While Hase falls into the pathetic fallacy, it's really well done and it's not hard to sympathize with him because he's a high school student and doing his best even when he's aware he's not the sharpest tool in the shed. That's why he depends on his friend, Shōgo Kiryū, who is reliable and sharp serving as someone to steer him right when he loses control of his emotion. Kaori is really sweet, and smart once she opens up. And then there is Saki Yamagishi, a clumsy and forgetful girl, but cheerful all the way. Their personalities all compliment each other and the chemistry is there. Animation - The pastel color palette combine with watercolor like texture makes the anime a real joy to watch. The anime does a good job at matching the weather with the mood to add in a little drama which I think works really well. Music - Like the animation, the piano and string instrument music compliments the soft color tone used in the anime - it's very gentle even when it's tragic. Chemistry - Between Hase and Kaori, the chemistry works. It doesn't feel as if the characters are force into a relationship by bizarre circumstances. Rather, the show is about the journey of becoming good friends and maintaining that friendship. Character Driven - Because this is a show of little action, many of the episode plots are heavily character driven mostly through dialogues and small gesture. This is where the show got me, and can be a real tearjerker or heartwarming. This is probably the number 1 show for Anime Spring Season 2014 for me. Almost everything about it, I love from the story to the characters to the animation. It's well done and everything seems to blend really well together. It's an anime that really focuses on the journey rather than the destination and isn't bogged down by fanservice. And I'm man enough to admit that this made me want to cry.